If a former Chief Justice and Vice-President of India could consider e it a privilege to write a foreword to a book on Sai Baba of Shirdi, can one imagine what my feelings are as I pen these words? I feel like an ant before an elephant, entirely unworthy to write a foreword to so precious a work as a translation of Sri Sai Satcharita into English. I feel entirely inadequate if honoured and crave the reader’s indulgence for my impertinence. Those who have read Sai Baba of Shirdi would have noticed that towards the end of the book we had provided a bibliography of literature we had referred to in the preparation of our work but it did not then occur to us to comment either on the nature of our sources or their importance. 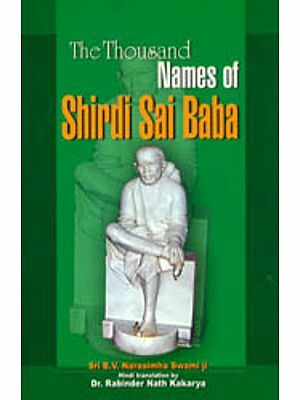 As the bibliography which is fairly extensive would show, there are several books on Sai Baba, not only in English, but also in Hindi, Gujarati and Marathi. Actually as source books the most valuable certainly are those works in Marathi like Govind Raghunath Dabholkar’s Shri Sai Satcharita which was serialized in Sri Sai Leela which first came out in 1923, five years after the Baba passed away. As is well known, and as the translator of this work into English, Smt Indira Kher, has pointedly drawn attention to the fact in her Note, ‘Shri Sai Satcharita is the Bible of Sai devotees in every sense of the word.’ As Smt Kher has further put it: ‘In its veracity, sanctity, faith and devotion that it inspires, and the deep satisfaction and a sense of fulfillment that it brings to the devotee, it has no equal’. No, it hasn’t. That is for sure. And why? To quote Smt Kher again: ‘Its sanctity derives from the fact that its idea was conceived during Baba’s lifetime and with his blessings and express permission. Note the words. The Satcharita is not something written as an afterthought or long after the subject had passed away into history. It was begun during the lifetime of baba with his 'Blessings’ and `express permission and by one who was witness to Baba’s leea’. It is as if St John or St Luke or St Matthew had written about Jesus during the period of his mission, with his express knowledge and permission. Christ’s mission hardly lasted a couple of years and at a time when it could not have been easy to put anything down on paper. Besides, he was constantly on the move and it would have been a heroic task for anyone to record every word that he said and every deed that he performed. 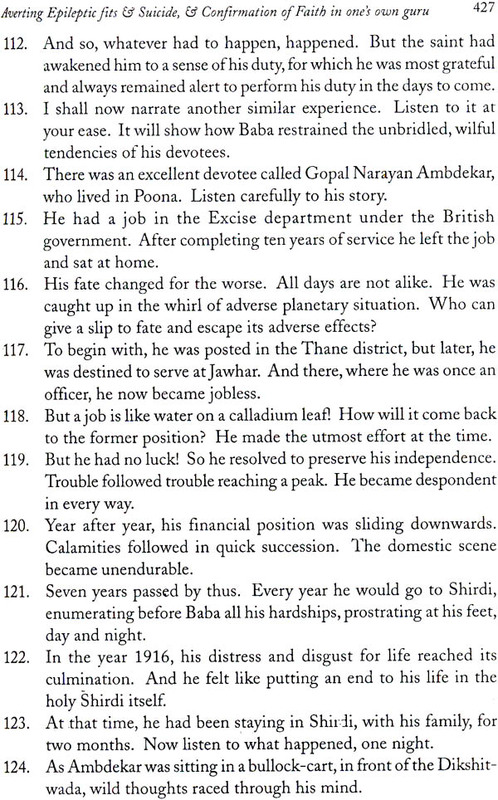 But this was no problem for Shri Dabholkar in the nineteenth and first decade of the twentieth century. True, Shri Dabholkar began his writing only during 1922—23 and it was completed six years later but there were people still around who could challenge his facts or vouchsafe for their accuracy. The fact that the Baba’s devotees cherish the work and use it with great faith and devotion, often reading a chapter or more as part of their daily worship, testifies to its absolute veracity and accuracy There is no need for any further evidence. In any event it is impossible to conceive that Shri Dabholkar would concoct stories to embellish his work. For one thing it would have been a grievous hurt to the memory of Baba; for another Baba did not need any embellishment of his life and work. He was beyond praise and blame. That is why Shri Sai Satcharita is of special relevance and that is why it is read with such reverence. It is well to remember that it was originally written in verse form. That would partly explain why it took Shri Dabholkar so long to complete it. A work of art is not completed in a hurry. And Shri Dabholkar was a conscientious poet; no wonder the Baba called him his ‘Hemadpant’, after the famous and learned court poet of the thirteenth century Yadavas. The one drawback of Shri Sai Satcharita is that it was written in Marathi. That millions of Baba devotees are unable to read it. As Smt Kher has acknowledged `it is little wonder that one hears many a sigh, a groan, a regret from those who cannot read’ the book in the original. What is astonishing is that no serious attempt had ever been made at a detailed, chapter—wise English translation so far. She is, and long has been, an ardent devotee of the Baba and would not, in any circumstances, be unfaithful to the original text. As a Maharashtrian born and bred, her knowledge of Marathi, her mother tongue, is impeccable. So, for that matter, is her knowledge of English. In tact, she took her Doctorate in English literature! Knowing the Khers as I do, I may also reveal that whenever Smt Kher was stumped for the right word or the right nuance of a word, she hail no hesitation in consulting an appropriate Marathi—English dictionary. This is not assumed humility but the practised approach of in English teacher steeled in the discipline of translation. For those unaware of Shri Sai Satcharita it is necessary to add that in the original it runs into 53 chapters and contains more than 9,000 verses. Every chapter has a judicious mixture of philosophy, stories and anecdotes along with Baba’s teachings. Baba was never didactic in the sense of wishing to give a sermon for the sake of a sermon. He met his disciples and admirers and conversed with them but in all his talk there was that subtle element, that unstressed message that went straight to the heart, precisely because it was unstressed. I have read this translation with utmost joy. It is written in plain English and what is more it gives us a flavour of the original Marathi. That is its special appeal. Smt Kher has resisted the temptation to provide only the gist of the original in an effort to ‘cleanse’ the Indianness of the original. Had she done so, she would have destroyed its essential beauty, its unique feature. Reading the translation one has the feel of the rhythm and beauty of the Marathi text— and that thanks heavens, is how it should be. Those ‘gems of wisdom’ are here gathered and are available for the mere asking. May the reader be richer for them? And may the grace of Sai Baba envelop them in his loving embrace. ‘Shri Sai Satcharita’ is the Bible of Sai devotees in every sense of the word. In its veracity, sanctity, faith and devotion that it inspires and the deep satisfaction, a sense of fulfillment that it brings to the devotee, it has no equal. It is a verse composition, styled on saint Eknath’s renowned Eknathi Bhagwat and contains the known facts about Shri Sai Baba’s life at Shirdi, as also his teachings. Its veracity lies in the fact that not only was its author a frequent visitor to Shirdi during Sai Baba’s lifetime and a witness to many of the incidents that he refers to in the book, but most of the stories and anecdotes recorded therein, have been confirmed by one or the other of the devotees, who were his contemporaries. Its sanctity derives from the fact that its idea was conceived during Baba’s lifetime and it was with his blessings and express permission that the work of keeping a record of the many incidents, facts, etc., was begun. The actual writing started in 1922-23 and the book was completed and published in 1929. The feeling of satisfaction, of fulfillment while reading the book, has its source in the love and faith that Sai Baba’s unique, saintly personality inspires, as also in his fascinating leelas that captivate the devotee’s heart. His simple, yet spiritually enriched, way of life with its supreme detachment and renunciation, and his method of imparting spiritual instruction and guidance to the devotees through instances and experiences of their daily lives have an unfailing appeal. The appeal endures and will continue to do so, for Baba’s spirit was not confined to the three and a half cubits of his physical body, but pervades the entire creation, even to this day. Sai Baba’s was the Guru-marg, which believes in the Oneness between God and the guru, the guru and the devotee, between the Creator and His creation. Guru being the incarnation of God, without his grace and guidance, the highest goal of human existence, which is God realization or self— real-realisation, can never be achieved. But out-c he devotee, succeeds in winning the guru’s grace, the guru takes his responsibility, not only for this birth, but for birth after birth, till the goal is reached. Of the different ways of God realisation, Sai Baba advocated to his devotees the easier path of Bhakti’ or devotion to the guru. The guru’s grace can be won by absolute faith in and total self-surrender to the guru, and by infinite patience, forbearance and courage. This was the only guru dakshina Baba himself expected from the devotee. Baba was divine and yet so human! He was so far and yet so near! He believed in teaching by example rather than by precept and he never sermonized. He performed no miracles. Miracles happened as a natural consequence of his spiritual and yogic powers. Like any of us, he would bargain for a fair price when purchasing anything and only after fixing the proper price would he reward the seller by paying him a little extra. To the man who brought a ladder for him to climb, he at once paid his due, showing that no labour should be accepted free of charge. Even in his last moments he did not forget to give in charity to Laxmibai Shinde. In these and a thousand other ways he taught the householder his duties, guiding him to the path of righteousness. His tender love and deep concern for the devotees’ welfare — both spiritual and material — his tearful farewell to Megha, his delightful use of humour to teach a valuable lesson or to nip in the bud -a threatened quarrel between the devotees, his sending away the devotees and close associates to escape the meshes of Maya, as the end drew near, these and the such—like traits bring him closer to us by revealing the human side of his personality. And yet, who can miss the divine qualities that raise him to the eminence of a godhead? The perpetual state of samadhi, the total detachment and non-possession, the Peace, Benevolence, Mercy, — these leave us in no doubt that Baba, who was such a mine of virtues, was none other than God Incarnate. But what lends charm to the story of this saint of Shirdi is a certain element of mystery and symbolism. Practically nothing, for instance, is known about his guru or his early spiritual sadhana and, as to whether he was a Hindu or a Muslim, the devotees could never determine, in the face of contrary indications. 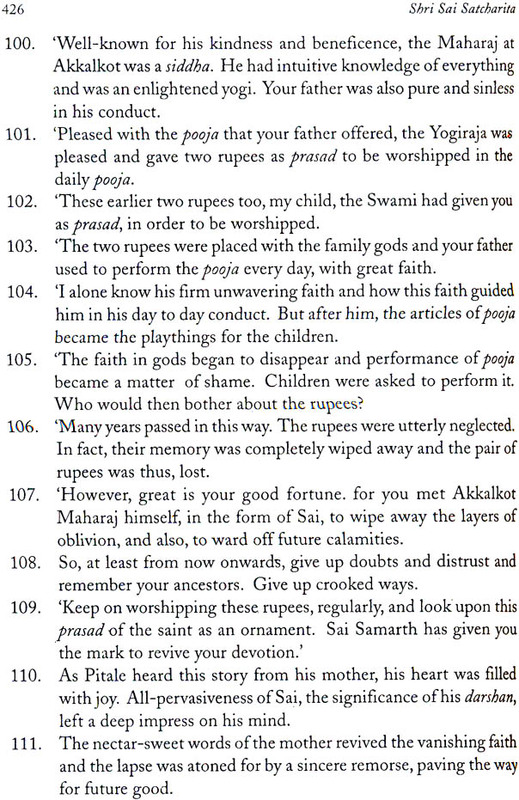 Similarly, his giving udi to all who came to him, or his asking for dakshina in the form of money, his dhuni, the collecting of alms from five households, etc., were all symbolic and often misunderstood as their real significance was completely missed. And it was the symbolism in Baba’s actions that first attracted the attention of the author of Shri Sai Satcharita. Shri Dabholkar was intrigued when he heard Baba’s command to the women of the village to sprinkle the freshly ground wheat flour on the banks of the stream at the village boundary, which, he later learnt to his amazement, was to rid the village of the menacing cholera epidemic. This incident inspired him to write Shri Sai Satcharita. The author Shri Govind Raghunath Dabholkar (18594929) was himself a Sai devotee who, on seeing some of the miracles, felt such an awe and wonder at Baba’s leelas that he felt a strong urge to write an account of them for the devotees and especially for posterity. Shri Dabholkar did not have much academic education. He was a servant of the Bombay Government and his last appointment was as a magistrate in the Bandra suburb of Bombay. But, a poet by heart and well—versed in ‘Jnaneshvari’, ‘Eknathi Bhagwat’, and the like, he was able to move the hearts of the devotees and confirm them in their faith through this poetic composition in Marathi. So imaginative is the presentation of facts, replete with poetic embellishment and philosophical wisdom, and, so evocative in expression that there is hardly a reader who is not captivated by the book. Baba may have foreseen the result, for, even before he had started writing the book, Baba once jokingly conferred on the author, the title ‘Hemadpant’ (after the learned court-poet and author of the Yadavas in the thirteenth century, called Hemadpant). And as one completes reading the book, the mind is filled with a silent elation and a feeling of fulfilment. The book runs into 53 chapters, containing 9,308 verses. Every chapter has a judicious mixture of philosophy, stories and anecdotes, and Baba’s teachings, which always emerged as the implicit moral of a story. The proportion of these elements varies from chapter to chapter, some chapters being more philosophical than others, depending on the story narrated. However, the book is essentially a pothi’ (a religious text) and as in all pothis, one does not look in it for historical truth or a chronological order of events. Moreover, in the original Marathi version, one tends to get a little confused with regard to Baba’s original utterances and the author’s philosophical commentary, as these are not clearly indicated by the placing of the inverted commas. But the devotees cherish the book, use it with great faith and devotion, reading a chapter or more as part of daily worship. It is also used for a continuous reading to be completed in one week, in three days and so on, as personal worship and also as part of celebrations and festivals in Shirdi. Such being the revered place of this book in the hearts of Sai devotees, it is small wonder that one hears many a sigh, a groan, a regret from those who cannot read it, because it is in Marathi or Gujarati, and not in English. No systematic attempt has been made, so far, at a detailed, chapter—wise English translation. Hence in view of the demand for such a book, especially from the South, this humble attempt at an English translation, chapter by chapter, verse by verse, line by line, with notes to help the reader understand the text better. The latest prose version of the book in Marathi, with a wealth of information, by Lt. Col. M. B. Nimbalkar, has been of invaluable help to the present translator.